DIY - Mouse Race fundraiser! Hall Saturday. They hope it becomes an annual event. Participants purchased chips that they would then use to “bet” on 10 mouse races over the course of the evening. 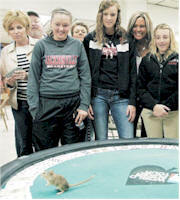 Various area businesses donated money to sponsor the races, which were held in a large wooden structure and featured mice with names like Mousain Bolt, Cat Daddy, and Secretari-rat. In addition to races, the event featured mouse roulette, a game where people paid two dollars for a playing card and gathered around a table with a full deck spread around the edge. A mouse was then placed in the center of the table, and the first card the mouse touched determined the winner of the game. The stakes may not have been as high as at the Kentucky Derby, but the proceeds should put a dent in some of the team’s expenses over the summer. “This fundraiser is to benefit the summer basketball program,” Crimsons’ coach Jeannette Barlow said. “We travel to different tournaments throughout the summer … and we want to try to raise some money and alleviate some of the cost.” Barlow heard about mouse racing from a co-worker who had participated in an event in Carlinville, and thought it would be fun to try in Jacksonville.